Chocolate Panna Cotta: A decadent, creamy chocolate pudding is made with simple ingredients and allergy friendly. This dark chocolate panna cotta is egg and gluten free with dairy free and paleo options. Thank you to Vital Proteins for sponsoring this post. As always, all text and opinions are my own. This post may contain affiliate links, read more here. Today is my birthday!!! And it is a big one for me. Nope, it’s not my 25th, 30th, 40th or 50th. So why is this such a big birthday for me? I have Cystic Fibrosis and the average life expectancy for someone with CF is 37. So this birthday smacks me hard with the reality of my disease. But guess what? Despite what the textbooks say, I am defying all odds and will continue to do so…but in the meantime, I am going to treat myself to some dark chocolate pudding, and I think you should join me. Friends, there is nothing I like more than chocolate. One of my closest friends has said on many occasions, that after hanging out with me she craves chocolate after breakfast, lunch, and dinner. From chocolate in my coffee, to chocolate in my protein shake, to chocolate in my desserts of course, I find a way to sneak in chocolate throughout my daily eating routine. So what better way to celebrate my birthday than with a big bowl of homemade dark chocolate pudding? Okay, this is not really a pudding, I am talking more about a panna cotta. What is a Panna Cotta? It can be a bit confusing to know if a dessert qualifies for a panna cotta, a pudding, mousse or custard. And really I don’t care what you call a dessert as long as it tastes good. BUT I will clarify these terms so you can feel like you are in the know. In Italian, panna cotta means cooked cream. However it is traditionally served cold and molded. Really panna cotta is just a simple pudding that is molded and served cold. Instead of being thickened with eggs like a custard, or cornstarch like a pudding, panna cotta is thickened with gelatin. In order for panna cotta to be molded, gelatin is key. 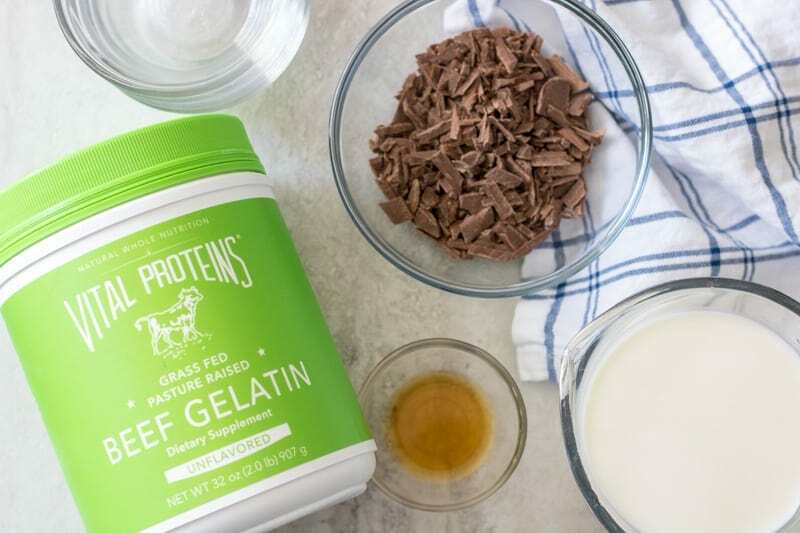 I use Vital Proteins Beef Gelatin, a pasture-raised, grass-fed bovine hide gelatin powder made with no artificial flavors, supplements or fillers – just bovine hide gelatin. In fact, not only is it pure, but it also is filled with protein and is a from of a collagen. Confession Time: Cystic Fibrosis causes digestive distress, dry skin, weak nails, weak bones and a need to have high protein diet. Guess what the benefits of collagen are? 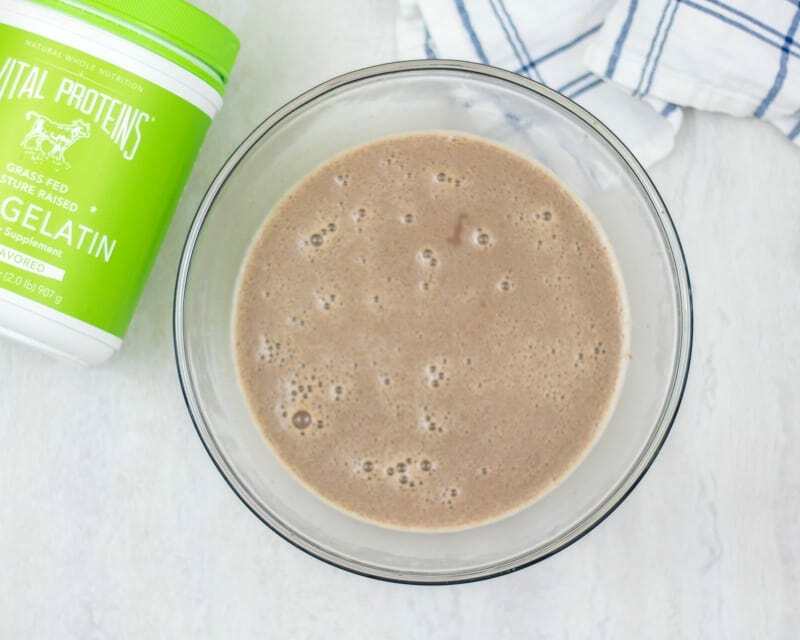 Collagen helps support healthy hair, skin, nails, and bones. Collagen is a source of quality protein. Sounds like all the more reason for me to enjoy more than one or two, servings of this healthy chocolate pudding–I mean panna cotta, see confusing! It is incredibly simple to make homemade panna cotta. The only hard part about the entire process is waiting for the panna cotta to set up. Step One: Prepare your panna cotta molds. I use 6 ounce glass ramekins that I grease with melted coconut oil. You can use any 6-8 ounce mold you like, even custom panna cotta molds. In fact, you can even use glasses and serve the panna cotta right from the glass if desired. Step Two: Bloom the Gelatin. To bloom gelatin just means to let the gelatin soften in liquid. 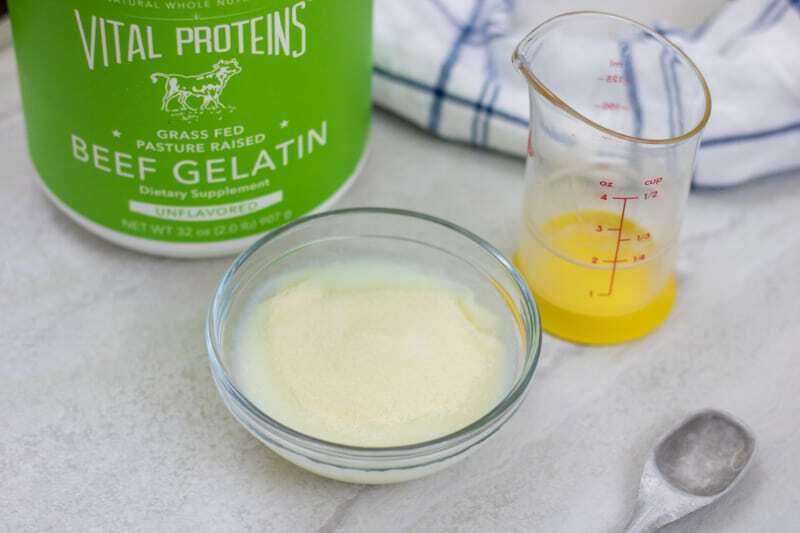 Simply sprinkle the gelatin over a 1/4 cup liquid and let it rest for 5 minutes—no mixing or anything! Step Three: Heat the Cream. Over medium-low heat, gently heat your choice of dairy (or non-dairy) gently. Add in espresso powder and vanilla extract to bring out the rich chocolate flavor in the panna cotta. Step Four: Whisk in the Bloomed Gelatin into the Panna Cotta. Once the cream mixture is just simmering, add in the gelatin and whisk well. Remove from heat. It is important to not allow the cream to boil. Step Five: Pour the heated cream over the chocolate. Over a strainer, pour the cream over the chocolate. The sieve is not necessary, but I like to use it to produce a super creamy, smooth panna cotta. The warm cream will melt the chocolate as you whisk the chocolate into the cream. Step Six: Divide Panna between prepared ramekins. Once the chocolate is melted into the cream, divide the heated cream between the ramekins. You may want to pour your chocolate mixture back through the sieve again, to catch any lumps, but that step is not necessary. Step Seven: Chill the Panna Cotta. 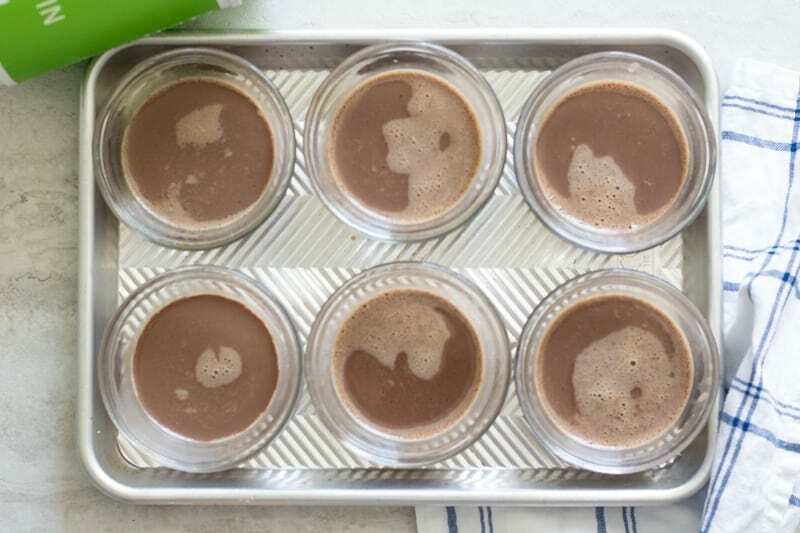 Place the chocolate panna cottas in the fridge for at least 4 hours. If you are leaving in the fridge for over 4 hours, cover with plastic wrap, for up to 3 days. Step Eight: Unmold the Panna Cotta. To unmold panna cottas, place each ramekin in a bowl of warm water, that reaches halfway up the side of the ramekin, for 2-3 minutes. Remove ramekin from water and invert on a plate. Serve with berries, powdered sugar or as is. You can use any 6-8 ounce mold you like. In fact, you can even use glasses and serve the panna cotta right from the glass if desired. For this Easy Chocolate Panna Cotta, you can use either cream, whole milk, or coconut milk. I personally love the to use canned coconut milk. The coconut milk makes this panna cotta extremely rich and the coconut flavor pairs well with dark chocolate. To make Dairy Free Chocolate Panna Cotta, use dairy free chocolate and coconut milk. 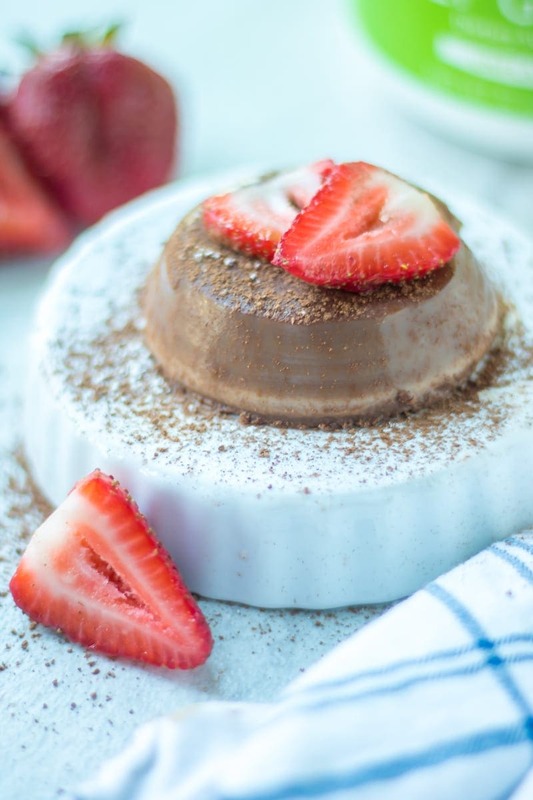 To make Paleo Chocolate Panna Cotta, use coconut milk as your choice of dairy and Paleo approved chocolate. If you are using dairy to make Chocolate Panna Cotta, I like to use 1 cup heavy cream and 1 cup milk for a creamy result. You may use all whole milk, all heavy cream or even half and half. I would not recommend low fat milk when making a panna cotta, as you want a velvety, rich consistency that is not achievable when using low-fat milk. Chocolate Panna Cotta will keep in the fridge for up to 3 days. Fresh Panna Cotta is best, but you can also freeze panna cotta (unmolded), for up to 3 months. Defrost in fridge over night before serving. Panna Cotta is the PERFECT allergy friendly dessert, as it is naturally egg-free, gluten-free, nut free, soy free, and corn free. 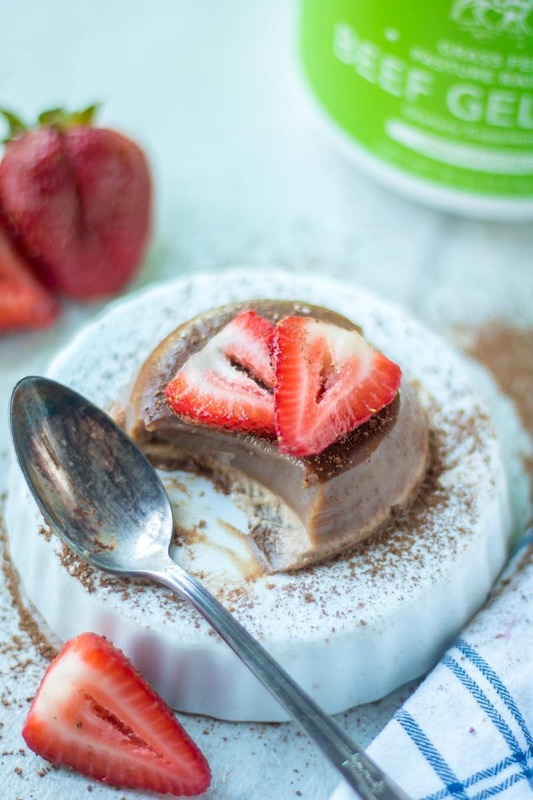 If you use non-dairy milk and chocolate, chocolate panna cotta can also be made Paleo, Whole-30 approved, and dairy free. A decadent, creamy chocolate pudding is made with simple ingredients and allergy friendly. This dark chocolate panna cotta is egg and gluten free with dairy free and paleo options. Grease 6 (6 ounce) ramekins with melted coconut oil. Bloom the gelatin by sprinkling the gelatin over a 1/4 cup coconut milk and let it rest for 5 minutes---no mixing or anything! Over medium-low heat, gently heat your remainder of coconut milk gently. Add in espresso powder and vanilla extract, and whisk well. Over a strainer, pour the cream over the chocolate. The sieve is not necessary, but I like to use it to produce a super creamy, smooth panna cotta. Whisk the cream into the chocolate to fully incorporate and melt chocolate. Once the chocolate is melted into the cream, divide between the ramekins. To unmold panna cottas, place each ramekin in a bowl of warm water, that reaches halfway up the side of the ramekin, for 2-3 minutes. Remove ramekin from water and invert on a plate. Serve with berries, powdered sugar or as is. You can use either dairy milk/cream or coconut milk. I use canned, full fat coconut milk. Panna Cotta will keep in the fridge for up to 3 days. Fresh Panna Cotta is best, but you can also freeze panna cotta (unmolded), for up to 3 months. Defrost in fridge over night before serving. LOVE panna cotta – this looks so easy too! Crytal, I hope you do give this recipe a try. It is SO easy, and tasty. I love how easy this is! This is a must-try! Liz, I hope you enjoy every bite! Congrats on defying the odds! That is awesome, what a great feeling for you this birthday. I absolutely love that you used vital proteins in this recipe!!! So fun! Oh thank you so much Elizabeth! It was a great day and a wonderful thing to celebrate! And vital proteins are wonderful! I hope you give this a try! I’ve never had this before, but it looks super yummy! This is a wonderful allergy free dessert! I love how you added espresso powder! It is so tasty! Love that you added extra proteins to this beautiful dessert! It really helps justify that extra bite, right?! Well, at least it helps balance out the sugar and carb count for those who struggle with insulin and diabetes. This was so so so good! We adored it and my sweet tooth was completely satisfied! Yay!! That makes me so so happy Susanne! I love panna cotta! This recipe is great! I gave up dairy recently so I needed a dairy free option. Thank you! WAHOO!!! You have to love when you can find something to that fits your dietary needs. I am so happy this recipe hit the spot Tayrn.